The Agilent 1200 comes from a long lineage of reliable High-Pressure Liquid Chromatographs (HPLC) from the world’s leader in Chromatography technology. The 1200 HPLC are even more flexible than its cousin the Agilent 1100. Each module is plug-and-play through the Agilent CAN cables giving the Agilent 1200 system a design with increased speed, sensitivity and resolution in mind giving you increased productivity, saving you time and money. The Agilent 1200 autosampler provides more precision and less carryover delivering unmatched flow through even for high absorptive compounds. The multi wavelength diode detector covers a range from 190-950 nm and has a data rate of up to 80 Hz. This Agilent 1200 HPLC system comes with the ever popular, very easy to use ChemStation Explorer software. Custom build your own assays in a matter of minutes or choose from several standard protocols. 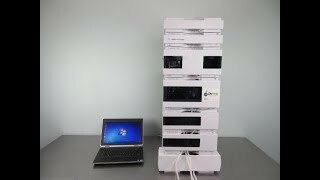 This Agilent HPLC stack is comprised of a G1378B Vacuum Degasser, G1365 MWD Detector, G1376A Pump, G1377A Micro WPS Well Plate Autosampler, G1330B FC/ALS Thermostat and a G1316A TCC. This Agilent 1200 HPLC System has been fully inspected and comes with a currnet validations for each of the components. All of our lab equipment comes backed with our standard warranty. If you're interested in this used Agilent HPLC don't hesitate, give us a call at 617-999-5746.